Windows® 7 has a built-in firewall that provides security by limiting or preventing access to your computer from the internet. Sometimes, built-in firewalls like the one included in Windows 7, conflict with the firewall on the Linksys router. In such cases, you have to disable the built-in firewall for Windows 7. NOTE: Disabling the Windows Firewall should only be done temporarily to allow downloads or hardware installation on your network. Changes within the network may require you to re-enable Windows Firewall for your computer’s protection. Click the Pearl button. On Search programs and files field, enter “windows firewall”. Under Control Panel, select Windows Firewall. When the Windows Firewall window appears, select Turn Windows Firewall on or off at the side bar. 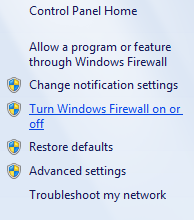 When the Windows Firewall Settings screen appears, select the option next to the icon under Home or work (private) network location settings. NOTE: It is only necessary to turn OFF the firewall for private networks. NOTE: To enable the Windows Firewall again, repeat the steps above but select the option next to the icon in Step 4.